The islands and salt marshes off the coast of South Carolina are teeming with wildlife and activity. To see the fascinating marine creatures, birds, and other wildlife up close and experience what goes on just past the shores of the Lowcountry, take an eco tour on the Isle of Palms! From sunset dolphin cruises to peaceful kayak tours, there are several wonderful options for exploring nature in the area. Discover where to find the best eco tours near the Isle of Palms below. If you’re interested in eco tours on the Isle of Palms, you’ll love the rest of the outdoor activities in our Vacation Guide! Access your free guide today to discover all the best things to do on your Lowcountry vacation. We’ve included our top recommendations on Isle of Palms attractions, activities, restaurants, upcoming local events, and more. Barrier Island Eco Tours on the Isle of Palms, South Carolina, offers a range of options including private family tours, Capers Island wildlife explorations, dolphin cruises at sunset, crabbing excursions, shark fishing, marine biology camp, school trips, and more. Whether you’re interested in a private family trip or a large, scheduled group excursion, you can find both options with this tour company. Visit the Barrier Island website to see detailed descriptions of available tours and to book your trip! With six Lowcountry locations including the Isle of Palms Marina, Coastal Expeditions offers a range of adventurous tour options. You can explore Shem Creek by stand-up paddleboard, schedule a private eco tour charter, embark on a half-day kayak tour, and more. Coastal Expeditions also offers customizable group tours by boat, kayak, paddleboard, and foot. Visit Coastal Expeditions’ website for more details! 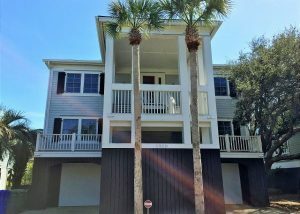 Looking for the Best Vacation Rentals on the Isle of Palms? Look no further than East Islands Rentals! We have the best vacation rentals on the Isle of Palms. You’ll be just minutes from the area’s best attractions, like Isle of Palms eco tours! From private beach access to your own pool, the luxurious options are endless with East Islands Rentals. 3000 Palm Boulevard, for example, features large screened-in porches, a private boardwalk to the beach, and six spacious bedrooms. This oceanfront home is perfect for a relaxing family getaway! Enjoy a BBQ in the backyard, sunset walks on the beach, and cozy movie nights in the comfortable living room. You can’t go wrong with any of our East Islands rentals, so start browsing them today and choose your favorite. We look forward to hosting your next Isle of Palms vacation!